Armed confrontations erupted on Friday between armed factions loyal to the United Arab Emirates and Saudi Arabia in the city of Aden. According to field sources, the truce collapsed again between factions loyal to the coalition in the city of Taiz and violent confrontations broke out in the residential neighborhoods, which forced dozens of families to flee and escape the shells falling on houses. The sources said that the militants of the Islah Party (the so-called Muslim brotherhood in Yemen) launched a large-scale attack on the Abu-Abbas battalions supported by the UAE and managed to control the strategic stronghold of Cairo Castle. 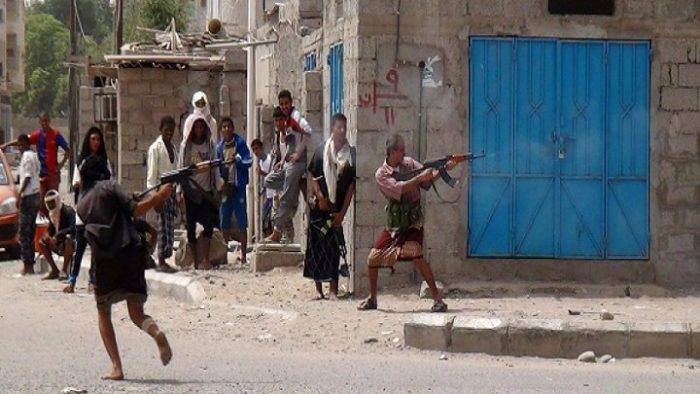 The fierce fighting took place in the areas under the control of the two factions in Jamal Street and Bab Moussa, while heavy explosions were heard in the vicinity of Abbas School in downtown Taiz, sources added. The most violent battles between the two sides began three days ago until a mediation succeeded on Wednesday on reaching a truce, however, such truce soon became fragile as clashes returned amid the insistence of the Islah Party to eliminate the Abu Alaab Brigades. In the midst of the fighting, dozens of families have fled the neighborhoods that are witnessing clashes with various types of weapons, tanks and artillery after the deaths and injuries of civilians during the past few days.